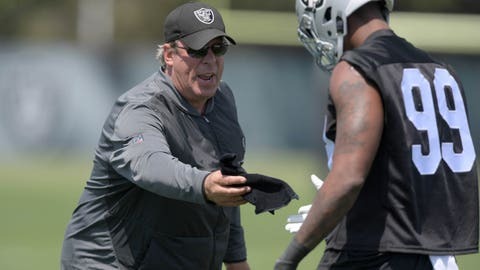 NAPA, Calif. (AP) — As he squares off against first-round draft pick Kolton Miller almost daily in training camp, Oakland Raiders rookie defensive end Arden Key rarely uses the same move twice. On one play, Key takes a jab-step inside then spins around to Miller’s outside shoulder and speeds past the big left tackle. A few moments later, Key bull-rushes his way between Miller and another offensive lineman with little resistance. It’s not an indictment of Miller so much as it is a credit to Key, the Raiders’ third-round draft pick who has been one of the early stars in training camp. Mack, the 2016 defensive player of the year, has been the Raiders’ best pass-rusher for the past four seasons. In hopes of giving him some help up front, the team used three of it first six draft picks to acquire Key along with defensive tackles P.J. Hall (second round) and Maurice Hurst (fifth round). Irvin compares Key to Aldon Smith, the talented but troubled former Raiders linebacker who had 33 sacks in his first two NFL seasons before off-field issues forced him out of the league.